Martin Linstrom recently conducted research into “the worlds most memorable sounds”. The sounds he describes are memory triggers or mnemonics, which after repeated exposure trigger association, emotions and behaviour. Whilst these mnemonics and audio logos are an important and useful part of your sonic branding palette – The role of sound in brand identity and communication should and does incorporate a much wider set of strategies and tactics. These range from audio logos/mnemonics to interactive environments, brand experiences and product sounds – the total sonic experience of your brand. Sonic branding is like an Aero Bar. Have you heard yelling and crashing through the walls? Have you heard the demeaning comment at work? Have you heard “NO” said more than once at the bar? never to remain silent about violence against women. Read more about the campaign at Campaign Brief. We are trying to raise some money for a very worthy cause: Action Against Hunger http://www.aah-usa.org. AAH is one of the highest rated and effective charities – offering support to those in distress in over 40 countries. If you wish to donate (any amount is accepted) please head over to our firstgiving page at http://www.firstgiving.com/cinesamples. After donating you will be sent links to this wonderful djembe as a way of saying thanks! Suggested donation is $10, our fund raising goal is $5000. Donation amounts will not be posted, name and comment is optional. So what’s wrong with that- isn’t the great El Jobso the creator of the Apple brand, the man responsible for Apple’s core values and DNA. Surely he’s best placed to make these decisions. Maybe – but as recent events have shown Steve Jobs can’t and won’t always be around. So what happens if he’s not around to pick the latest tune – who does?- Phil Schiller (senior vice president of world wide product marketing)? TBWA/Chiat/Day? What criteria do they use? Personal taste? – What, if anything has been put in place to help them stay on message? When your chief marketing officer leaves, or you change (ad) agencies – How do you ensure sonic continuity? We all know people/agencies love to leave their mark – out with the old, in with the new and all that. creates a solid platform from which to evaluate the need for and determine improvements and new directions. Flexicar a small car rental company in Australia has a great initiative where each month they put new CD in their cars for you to listen to whilst you drive around. Even nicer is that once the month has “expired” you can take the CD home with you… Nice touch. Everything about Flexicar feels easy (going). This simple promotion becomes even more potent when a company like Flexicar ensures that the music they are promoting consistently aligns with their brand ethos. Flexicar, please don’t change a thing. This could be put to great use as a mnemonic/trigger in integrated drink driving and speeding campaigns. For example placing them near schools. Interruption can be a good thing. 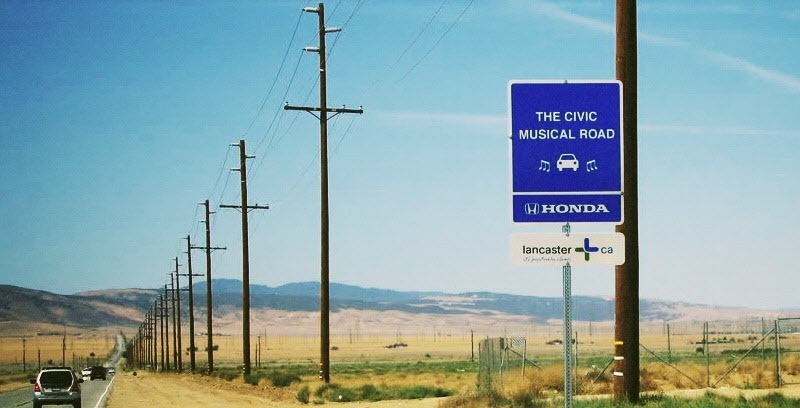 Lancaster, California has a musical road that has been pock marked with special grooves that sing out a tune. Made by Honda as part of an upcoming advertising campaign, the road plays “The William Tell Overture” and for best results the company advices you to drive over with a Honda Civic because the company says that the road was tuned specifically to the tires and wheelbase of a Civic. However the residents want the road back in original tar because many drive past out of key. …for best results the company advices you to drive over with a Honda Civic because the company says that the road was tuned specifically to the tires and wheelbase of a Civic. The choice of The William Tell Overture strikes me as odd for such an innovative brand and it isn’t compelling enough to motivate people to drive a Honda Civic in order to hear it in key. I was recently interviewed for an article about sonic branding for Brandchannel.com. You can read the article “India Turns Up the Volume on Sonic Branding” here. The comments section is also worth a read, as it illustrates the confusion that still exists around what sonic branding is and isn’t. A very big thank you to Preeti Khicha for the opportunity to participate, and for taking the time to explore the exciting and growing area of sonic branding. “It tells a story of ordinary lives, incorporating dialogue, projected images…voice overs and music that thumps with the insistent rhythms of modern urban living. I’m not sure if the interaction of sound and colour quite hits the mark – simplifying the colour and animations would help in creating more obvious connections between the sound and light – but the willingness of the crowd to participate is really inspiring. The use of human voice is really refreshing and personalises the experience. The means now exist to create amazing brand experiences by connecting the emotional expression of sound to the benefits and personality of your brand, in real- time interactive environments. Imagine this happening in front of your stores…. powerful stuff. “People with voices of different frequencies, rhythms or cadences will be able to evoke quite different magical patterns upon the surface of the building – a staccato chirping will result in a completely different set of visual effects to a long howl for example, blending old and new to continue animating the facade of the Minster”. More at InteractiveArchitecture.org and Haque.